shoesalaart on Check out My Sister! These beauties were ordered by a mom and her son for their daughter/sister! 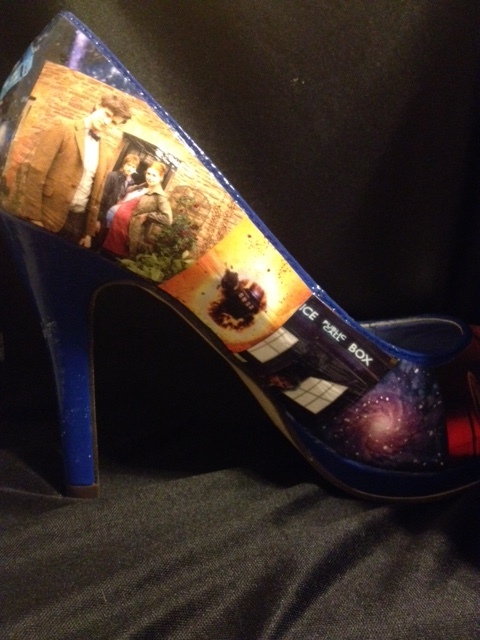 That heel was painstaking work and looks amazing! I love the monster toes! 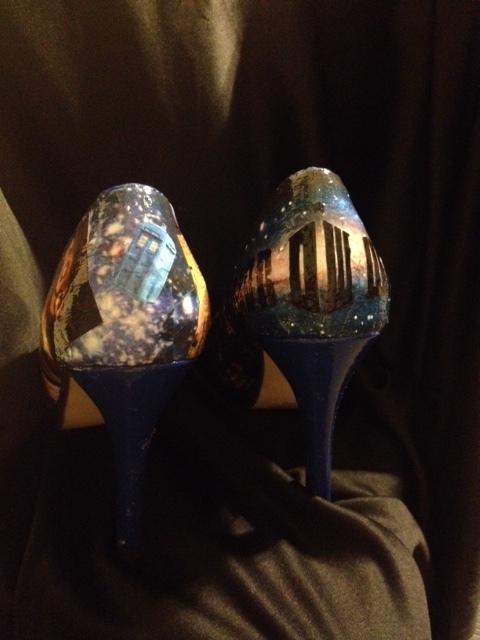 This pair was a mix of images from the Visual Dictionary, Hubble Space, and plain old police boxes (or were they?)! I can’t begin to describe the diversity in DW fans! They have repeatedly delighted me with their vision for individual pairs of shoes. 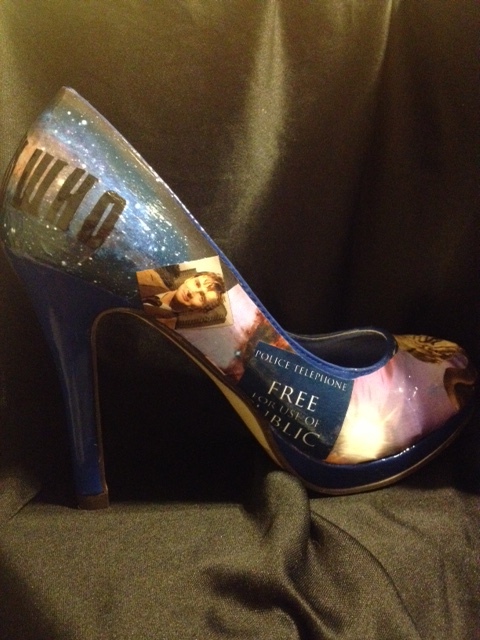 I hope that I live up to the wonder of the Time Lord! 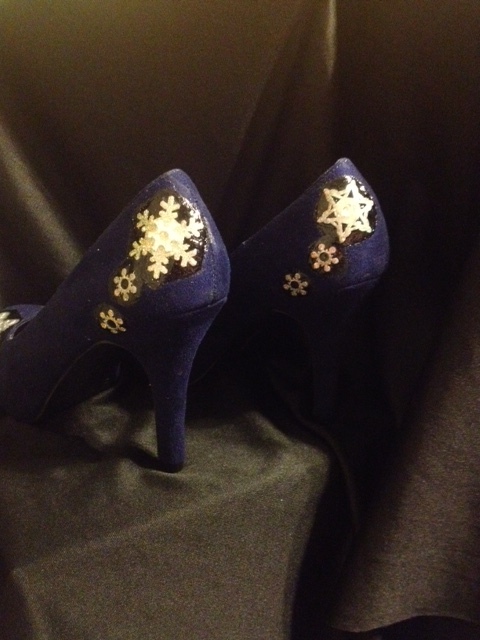 I had a blue suede just begging to be an Elvis shoe; when I saw these blue accented snowflakes and thought Oh Holy Christmas, Batman! 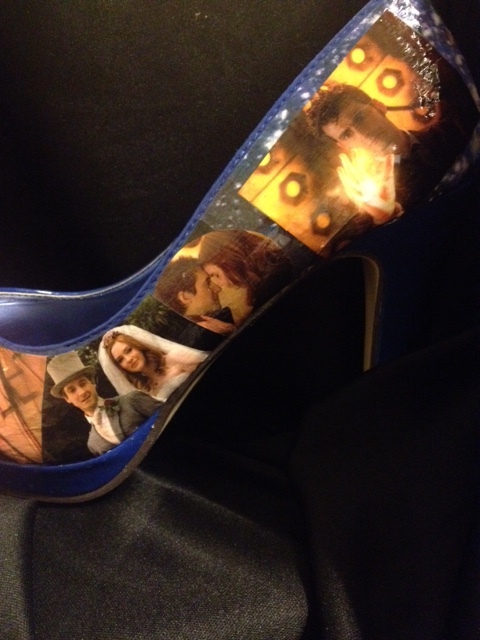 I didn’t want to cover the whole shoe as the suede is just beautiful! So I experimented with spot application. I was hoping that I could make the shapes flow and I think it came out beautifully! I decided to play with some glitter! I stayed with the color scheme of the stickers and wrote it out! I think they turned out nice! They’re on display at Dragon’s Lair Comics and Fantasy Austin; go check them out! 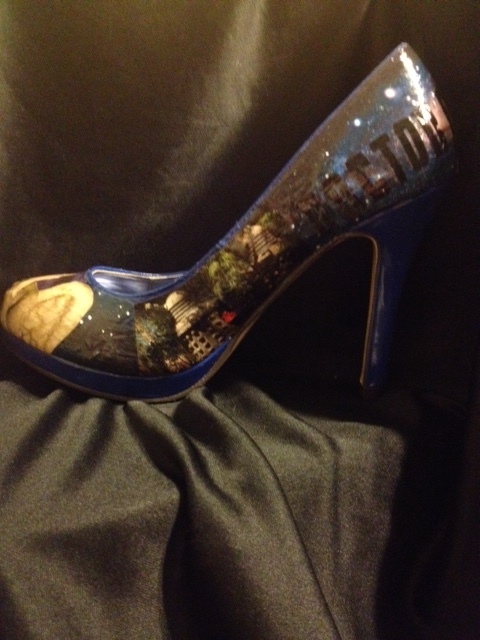 We continue to need support to purchase shoes that we offer our clients. Please help and SHARE! I apologize for being gone so long! 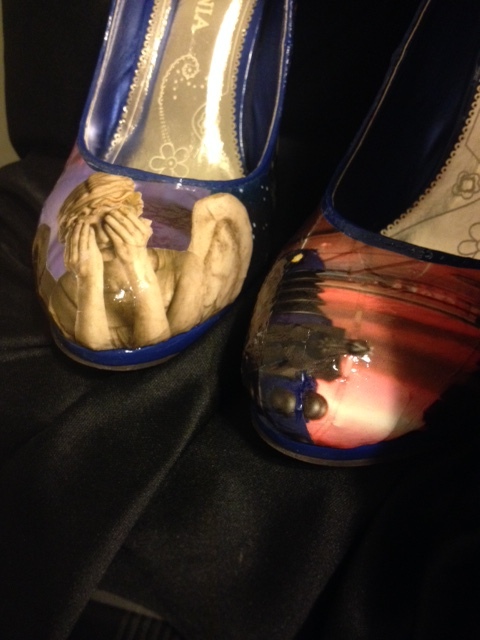 I have been working on two shoes… Star Wars and Dr. Who! I have also been getting ready for the upcoming Holiday season. Yeah, I know; I don’t want to think about it either. Halloween orders need to be in by October 10th to guarantee you Trick o’ Treat in style! Some comics you might want to put on your shoes (other than traditional monsters) include American Vampire, The Walking Dead, 30 Days of Night, Crossed, Locke & Key, or many others! And we have a deadline for Christmas order too! December 5th is your last chance to get the perfect gift for yourself or your friends! Shoot me an email shoesalaart@gmail.com and we’ll get your Holidays off to an art-tastic beginning!